Review: So much material has been written about the high school experience over the years. From novels to movies, college essays to anonymous e-mails, the educational landscape of these formidable years continues to provide material for public consumption. 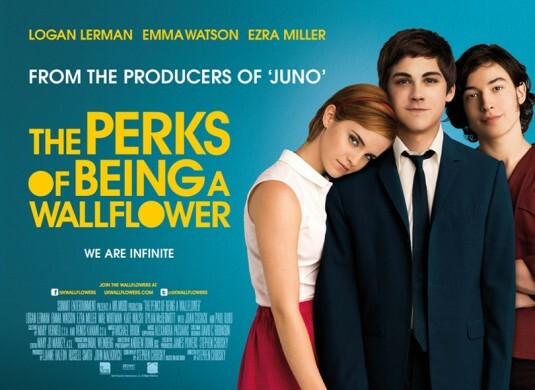 Director Chbosky has adapted his 1999 novel of the same name for the big screen, turning a dynamic book into a deeply felt movie that should strike a chord with anyone who has gone through the ups and downs during this pivotal time. Joining the ranks of other classic coming-of-age films like Lucas, The Breakfast Club, and Pretty in Pink, The Perks of Being a Wallflower is on the surface much like the rest of ‘em as it chronicles the lives of a small group of teenagers. What sets it apart is a fine attention to detail and sincerity sadly absent in films made for the young adult set today. Here is a film about teenagers that doesn’t talk down to them, it’s frank in its depiction of what happens when the teachers aren’t paying attention without pointing the finger at the adults being the root of the problem. These teenagers are making choices of their own free will that will have an impact (good or bad) on them at some point. With a valued maturity, I found myself deeply responding to the situation that our titular wallflower is facing. Charlie (Lerman) is starting off freshman life after a tumultuous year that is revealed in bits and pieces along the way. With no friends to speak of and a senior sister that has her own issues to deal with, he desperately wants to fit in but doesn’t know how to go about it. His eventual saviors are stepsiblings Patrick (Miller) and Sam (Watson), seniors who quickly bring him into their fold and introduce him to new people, places, sounds, and ideas. Over the course of a year, the film charts some tender moments that can be equal parts familiar and foreign to older audiences viewing this looking back on their own personal high school life. For teens of today, I’d imagine it’s a fairly accurate depiction of youths that grow up faster than we did when we were their age. Chbosky has written some heartbreakingly on the nose interactions, words that sting and situations that inspire all come together deftly for the first time filmmaker. Now that’s not to say it’s a perfect film…it’s not. While the film gets it mostly right there are times when it bites off more than it can chew. I think there are three too many Afterschool Special moments that burden the film rather than strengthen it. True, the performers handle these situations with authentic reactions but I think the film would be better without them. Secondly, the casting is a bit uneven which also unfortunately works against the film. Lerman is nigh-perfect as Charlie…everything he does suggests someone just bursting at the seams to belong and being sidelined by forces beyond his control. Miller, too, does a 180 degree turn from his unsettling work in We Need to Talk About Kevin to make the gay Patrick no stereotype or sympathy case. Whitman channels Carrie Fisher (that’s a compliment) in her role as a headstrong member of the clan that takes a liking to Charlie. The one bit of casting that never felt right was Watson in the lead female role and object of Charlie’s infatuation. Something seemed off in her performance that was never able to truly right itself completely. Several of her scenes with Lerman have an almost unbearable truth to them and these are the moments that should be remembered. Sadly, it’s countered with an American accent that wasn’t quite there and a general awkwardness that shouldn’t have been present considering the character she’s playing. Watson also looks too young to be a senior in high school…actually everyone looks the same age so the freshman Charlie doesn’t appear to be younger than his senior buddies. In the best movies about youth, adults take a back (screen) seat to the youngsters and that’s the case here. Rudd is his typical likable personality that’s balanced with care and compassion. McDermott and Walsh, identified only as Father and Mother, ably work with their small parts to convey what home life is like for Charlie. Lynskey and another actress that cut her teeth in 80’s movies (I’ll keep her name to myself) show up for brief but memorable cameos. It’s easy to see why this could sit on the same shelf as the John Hughes films of the 80’s. It skillfully navigates some of the more treacherous trappings of its contemporary counterparts and arrives as an upperclassman from the start. Though it doesn’t redefine its genre it successfully captures a lot of the pain, heartache, joy, and evolution that our high school cocoon can bring.